Tickets for most theaters showing the 2007 Drum Corps International Classic Countdown are now on sale. 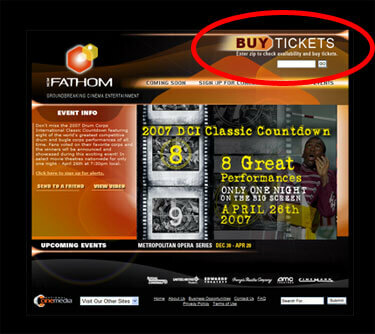 Find a theater to purchase tickets from by searching your zip code at the top of the Fathom Events Web site as seen below. Visit the Fathom Events Web site to purchase tickets. See a full list of theaters and additional Classic Countdown information on DCI.org.